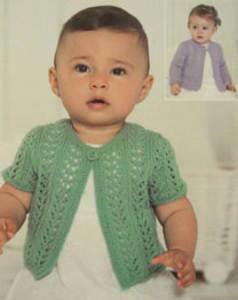 Long sleeved cardigan: 41-51cm 2 balls, 56-61cm 3 balls, 66cm 4 balls. Short sleeved cardigan: 41cm 1 ball, 46-61cm 2 balls, 66cm 3 balls. 50g balls Sirdar Snuggly 4ply, acrylic/ nylon blend (main photo shade 425). 4 ply tension 26st/ 37 rows to 10cm, 3.25mm needles. 2.75 and 3.25mm needles, 1 button.